Yesterday I appeared on John Beattie's Radio Scotland show to help "fact check" a couple of the statements made by Nicola Sturgeon during her interview with Andrew Marr (I wrote about it shortly after it was broadcast on Sunday: Marr Fails to Grill Sturgeon.). The other person on the line from the studio in Bath was Stuart Campbell, custodian of Wings Over Scotland and a crowd-funded SNP apologist. If you're just interested in the facts you can skip the next section. I recognise the term "crowd-funded SNP apologist" may seem rather dismissive. I use it only because during the broadcast Stuart referred to me as "some dog food salesman". It was a predictable attempt by him to deflect from the point being discussed by getting a rise out of me and I wasn't going to waste valuable airtime by biting. You can listen to the part of the broadcast I participated in here. It was an interesting debate (do listen if you have time, the segment was about 15 minutes long). This statement was shown to be false. Stuart from Bath asserted that the statement was in fact true because the price assumptions used were in line with (among others) the OBR. Unfortunately - despite being a "professional" blogger invited on to comment on this specific question - Stuart appeared not to know what the revenue forecasts he was defending actually were. I observed that at the time of writing the White Paper the £7.9bn oil revenue assumption the Scottish Government used for 2016-17 was £5bn higher than the £2.9bn the OBR were forecasting at the time. I suggested that it was therefore clearly incorrect to suggest that the SG forecast was in-line with all external projections for prices and revenues. I showed that the fact that the forecasts were not in-line with others' was clear at the time of the referendum by quoting the IFS May 2014 statement on "Oil: The Continuing Source of Disagreement"
The main point of disagreement is the different forecasts for revenues from North Sea oil and gas used. Our figures and the Treasury’s figures are based on the Office for Budget Responsibility’s projections. 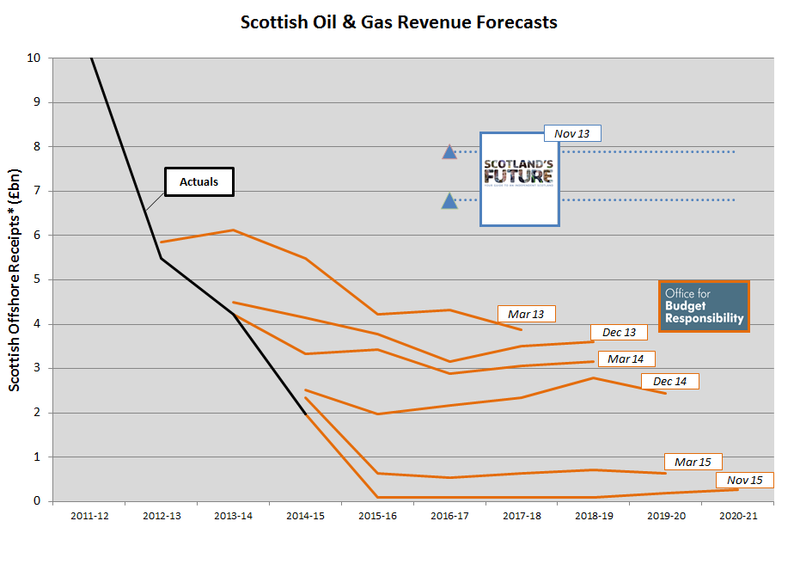 The Scottish Government report instead uses their own – higher – forecasts for North Sea revenues. Stuart countered with some predictable ad hom against me and accused me of "obsessing with the OBR's projections" as opposed to "everyone else". Unfortunately he wasn't able to cite a single alternative oil revenue forecast made by anyone else to back up his assertion. At the time of writing he has still not (either on twitter or his blog) been able to cite a single alternative forecast that would back up the statement. I've checked the SNP's website - they're famed for the speed of their rebuttals but I see nothing there to support the FM's assertion. I've gone back to read the Scottish Government's Oil & Gas Bulletin from March 2013 which includes the £7.9bn figure for 2016-17. The only other revenue forecast they refer to is the OBR (in the 5 page document the OBR is mentioned 10 times). We've established that the £7.9bn forecast was not in-line with the OBR and that the OBR (who are relied on by HMRC and the IFS among others) is a very significant "external forecaster". So the statement about being in-line with all external forecasters when related to revenue forecasts in the White Paper is demonstrably false. What interests me now is: were they actually in-line with any credible external forecasters when it came to forecasting North Sea Oil revenue generation in 2016-17? I'm sure they'll be able to dig out some from somewhere, but the fact that they haven't been able to yet speaks volumes. For completeness: the second point under debate was something I agreed was - as narrowly stated - true because it was a truism. Sturgeon said. As I pointed out - if you're flexible enough in your interpretation of a "few years" to include 8-10 years - then of course underlying GDP growth will eventually replace lost oil revenues. The point I attempted to make was that if you have to use all of the GDP growth over the next 8-10 years merely to plug the gap left by oil you can't use that GDP growth to invest in public spending. A corollary of this is that the fiscal gap that exists between us an the rest of the UK - widely referred to as the "black hole" - wouldn't be closed because of course the UK's GDP is also growing. "categorical agreement from the Yes and No sides alike that actually the falling oil price makes an independent Scotland MORE economically viable, not less"
I mean this is really desperate stuff. The Scottish economy will continue to pick up pace, despite the lower oil price having an adverse impact on the oil and gas industry. The University of Strathclyde institute's report's conclusions run counter to the view of the Bank of England governor, Mark Carney. For 2016, we have also revised down our forecast to 2.2% from 2.3% in June, in recognition that the slow down in the rate of recovery will continue into 2016 as exporting continues to be difficult due to the high pound sterling and because of the lingering effects on Scottish onshore activity of the low price of oil. In Scotland, weakness in the service sector has been affected by the onshore implications of the fall in the price of oil hitting business services in particular as well as mining and quarrying. The Survey also reveals the impact that the low global market price for Brent crude oil is continuing to have on the Scottish economy, with the performance of oil and gas service businesses dampening results in the Financial and Business Services sector. So whilst there's recognition that there is a positive demand boosting aspect to the fall in oil price, I see nothing there to suggest that it makes "an independent Scotland more economically viable". The rather obvious point here is that from the low point of now (with oil revenue this year estimated to be only £0.1bn) the economy boosting effects of lower oil price may be net positive - but relative to the indyref case that was presented (assuming £7.9bn annual oil revenue) it's frankly preposterous to argue that the chronic decline in the North Sea oil industry makes "an independent Scotland more viable"
Whilst nursing the effects of a night spent celebrating the immortal memory of Robert Burns - and contemplating the possibility that I may have bought the joys o'er dear - I watch the BBC's Andrew Marr show this morning. “At the time of the referendum the Scottish Government was predicting a 7.9 … up to a 7.9 billion revenue coming in from North Sea oil & Gas to the Scottish Government; that’s now .. a 13th1 of that is likely so it’s a huge, huge hole in the revenues. How does that change your thinking? What Sturgeon said is demonstrably untrue and Marr's panicky response suggests that - at best - he was poorly briefed. Nobody could accuse Marr of interviewing her as if he was holding her toes to that handily placed fire, but maybe she felt on the back foot because - well - he was making a rather pertinent point to which the SNP have no good answer. They have a bad answer though and it's the one that Sturgeon gave. The SNP will always answer questions about oil revenue forecasts with statements about oil price forecasts. Revenue and price are quite obviously not the same thing: North Sea revenue is a function of prevailing tax rates and oil producers' profit (which in turn is a function of price, extraction costs and production volume). Even asserting that the Scottish Government's $110 price assumption was in-line with all external projections is a stretch. In March 2013 (fully 8 months before the White Paper was published) the OBR was assuming $97 for 2016-17 (revised to $97.4 in the OBR's Dec 2013 forecast). This sophistry around price assumptions is par for the course. But in her reply Sturgeon either made an uncharacteristic slip or attempted to blatantly misinform the audience: she added the words "and for revenues". It's very clear: no matter how generously we try and interpret Sturgeon's statement - even if she missed the caveat "at the time of the referendum" or she was thinking of the lower £6.8bn scenario that the White Paper used - there is no credible way to argue that the Scottish Government projections used to make the case for independence were ever in-line with contemporaneous OBR forecasts. Or are we now to hear that the phrase "external projections" is somehow to be construed to exclude the OBR? "Well, I've said our growth in onshore revenues over the next few years is projected to [chuckle] significantly [/chuckle] outstrip the decline in offshore revenues ..."
"the case for Scotland as a strong independent country was never based on oil"
"our projections were not out of line with external projections"
For the growth in onshore revenues to significantly outstrip the decline in offshore revenues being referred to we'd need to see significantly more than £7bn of (real) growth in on-shore tax revenues. In 2013-14 our total onshore tax revenues (per GERS) were £50bn, so we'd need to see significantly more than 14% real growth in onshore tax revenues to "outstrip the decline". Given that the latest figures show a nominal rate of GDP growth for Scotland of 2.5% pa, I'm curious as to which projections she's referring to and what she means by "the next few years". It's also worth bearing in mind that we are used to seeing long-run real-terms increases in public expenditure - is Sturgeon suggested we would freeze Scottish public spending in real terms for the "few years" it would take for onshore revenue growth to fill the gap? How does that compare to what we can expect to experience in (Barnett funded) public expenditure growth over those same "few years" as a result of remaining in the UK? If including £6.8 - 7.9bn of oil revenues in the only financial projections you offered for the independence case isn't basing your case on oil then I don't know what is - £6.8bn is £1,273 annually for every man woman and child in Scotland. To put that in context, the Yes campaign claimed that independence would make us £1,000 per person better off within 15 years (without having to raise taxes). Just adjusting for the oil forecast error means that (optimistically) they'd now be suggesting we could get to the position of only being £250 per person worse off annually after 15 years of independence. The White Paper mentioned oil 157 times and the fabled oil "energy fund" 9 times; just because Salmond and others sometimes asserted that "oil is just a bonus" does not make it so. 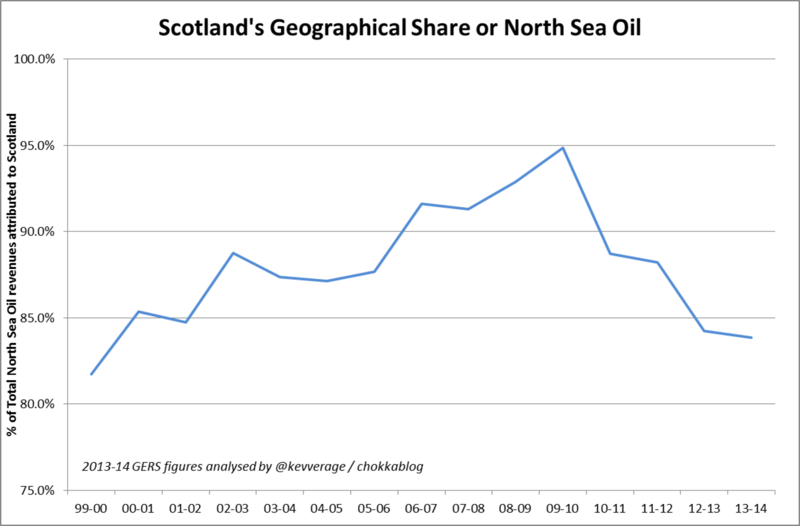 The case for a "strong independent Scotland" was always based on oil. She's repeating here earlier claim, so let's repeat the truth; the Yes campaign's projections demonstrably were out of line with the external projections made by the OBR. It's disappointing that Andrew Marr didn't pick her up on any of these rather fundamental points. 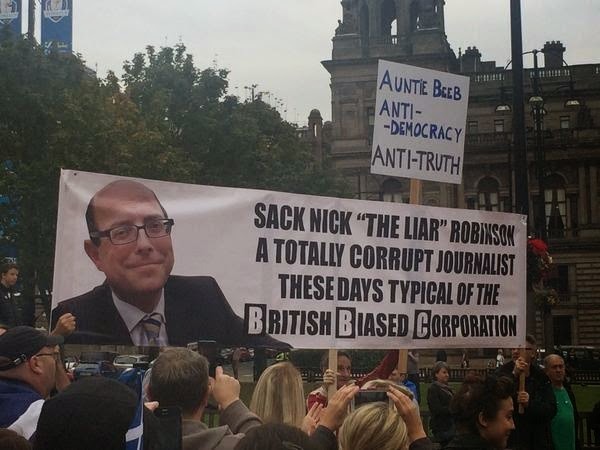 Maybe the SNP's BBC bashing has worked and he was fearful of getting the Nick Robinson treatment? 1. This is simply wrong and extremely generous to the White Paper. The latest OBR forecast (published in November 2015, page 103) is for total North Sea oil revenues in 2016-17 of only £0.1bn - so in fact that's a 79th of the £7.9bn used by the Scottish Government. Another proposal would be to bar or restrict companies from distributing dividends until they pay all their workers the living wage. Only profitable employers will be paying dividends, if they depend on cheap labour for those profits then I think there is a question over whether that is a business model to which we should be turning a blind eye. The idea that companies could be barred from paying dividends is certainly a headline grabber - it plays straight into the hands of those who see Corbyn as an anti-capitalist throwback obsessed with statist intervention. This is annoying because - as I hope I'll come on to explain - there's the kernel of a good idea buried behind the frankly bonkers wording used. Another proposal would be to ensure that those companies that can afford to pay the living wage, do. One mechanism that might be used to determine who those companies are could be that they pay dividends. After all, dividends are used to reward external shareholders and are paid from retained profits - maybe paying employees enough to achieve a minimum acceptable standard of living should be a precondition of shareholders earning a return. Now, this is still a fairly radical proposal but at least it avoids the incendiary and frankly impractical idea that the UK government could "bar" companies (many of whom are of course global concerns) from paying dividends. Now I'm no Corbyn fan (had you guessed?) but let's try and cut him some slack here. This wasn't positioned as a concrete policy proposal and he was addressing a left-wing think tank so it might be a good idea to brush over the unfortunate choice of wording and to - without necessarily having to get into a tank to do so - think about the underlying idea. The principle being explored here is that maybe a higher minimum wage requirement could be imposed on those companies who can afford it. A perhaps more business friendly corollary of this would be to suggest that the National Minimum Wage should be increased but companies who can't yet afford to pay it could be exempted. The question of course is how we define those businesses who "can afford it". Corbyn is saying "if you can afford to pay a dividend, you can afford to pay a living wage to all your employees". Before we can explore this idea further we need to clear up some widely held confusion about the term "living wage" (at least if my Twitter timeline is anything to go by). We assume Corbyn is referring to the Living Wage, a figure calculated annually by the Living Wage Foundation and which some employers voluntarily adhere to. This is not be be confused with the "National Living Wage" which is a simply a cynical re-branding of the National Minimum Wage for people over the age of 25. If you're confused by this, you're meant to be - it's why Osborne cynically co-opted the term "Living Wage" and applied it to what is actually just a new tier of the Minimum Wage. The "National Living Wage" is not and never was the "Living Wage" as defined by the Living Wage Foundation. It's worth pointing out that - because it's defined on the basis of the take-home pay required to have a minimum acceptable standard of living - the Living Wage is a function of prevailing tax conditions as well as the cost of living. The point being: had the proposed tax credit cuts gone ahead, the Living Wage (as defined by the Living Wage Foundation) would have needed to be raised yet further. Even if Osborne had changed the National Minimum Wage (for people over 25) to the level of the Living Wage as then defined by the Living Wage Foundation (he didn't), by proposing tax-credit cuts at the same time he was raising what the true Living Wage would have become. The first obvious point to make here is that the Low Pay Commission were given a remit from Government to advise how to set “NMW rates that helped as many low-paid workers as possible, while making sure that we do not damage their employment prospects”. It's implicit in this remit that all companies would have to pay the National Minimum Wage, so the NMW has to be influenced by the base level affordability for poorer performing companies (there's no point raising the minimum wage level to the point at which it puts many companies out of business and creates mass unemployment). There are other factors of course (such as international competitiveness) but let's assume the Low Pay Commission are doing their job well and the Minimum Wage is set at or near the highest level that companies on the whole can bear. Given we already vary the minimum wage by region and age*, why not tier it by corporate ability to pay - why shouldn't some companies be held to a higher minimum wage standard than others? * From April we will have different NMW rates for employees aged under 18, 18-20, 21-24 and 25+. Quite why it's deemed acceptable to pay a 24 year-old less than a 25 year-old for doing the same job is beyond me, but that's maybe a debate for another day. It's reasonably easy to argue for companies to have higher minimum wage thresholds in extreme cases: surely a company that pays its senior executives millions of pounds and generates super-normal returns for its investors shouldn't at the same time be paying some of its employees so poorly that they are living below what might be considered a "minimum acceptable standard of living"? If you're thinking "but it's ridiculous for some companies to have to pay a higher minimum wage than others", remember this will happen from April 2016 with the new "National Living Wage" (inside vs outside London) and historically corporation tax rates varied by level of corporate profit (profits under £300k used to be taxed at "small profit rates") and there are initiatives like small business rates relief that mean we discrimate in favour of smaller companies already. So if you accept the principle that it makes sense for some companies to be held to a higher minimum wage standard than others, how do we determine if a company should be required to pay a higher tier minimum wage? So far so straight-forward. Now let's say the company seeks to expand and so our owner-manager introduces external shareholders to give the business funding (somebody puts a chunk of cash into the business in return for a share of the business's equity). This external shareholder is not an employee and can only see a return on his investment through dividend payments (or selling on his shares ... but the person he sells on to can only see a return on his investment through dividend payments (or selling on his shares ... but the person he sells on to ... etc.)). This simple fact underpins a very important principle of corporate finance: equity is only worth the future value of the dividends the equity holders will receive. Because of the time-value of money (£1 today is worth more than a £1 in ten years time) we'd technically say the equity is worth the Net Present Value (NPV) of all future dividend payments, where the discount rate applied to calculate that NPV reflects the risk profile of the investment. I'm aware I'm labouring the point here, but it's absolutely crucial to this debate: a company (its equity) is only worth the money that the holders of that equity will receive and - other than by liquidating the business - that can ultimately only come in the form of dividend payments. Dividends are not some frothy excess - a company's equity is only worth it's future dividend prospects, they underpin the value of all stocks, the value of the entire stock market. Of course pension funds are very large share owners so anything that affects the value of future dividend flows affects equity values and jeopardises pensions. This is why barring dividend payments is a non-starter and Corbyn looks naive to even suggest it. The reality here is that nobody could expect large successful companies to stop paying dividends - but the government could impose on them a higher NMW figure (it's worth noting that over 2,000 companies who are already accredited Living Wage employers would be unaffected). The threat of barring dividend payments makes this proposal sound dafter than it is - it's simply a suggestion that companies who pay dividends should have to adhere to a Living Wage policy. The question then becomes: how appropriate is the "have ever paid a dividend" mechanism for defining companies who should be able to afford to pay the Living Wage? The positive argument for this mechanism is that it protects vulnerable businesses and favours start-ups. If you've yet to retain enough profit to pay a dividend you're probably one of those businesses that the Low Pay Commission is implicitly protecting when it decides how high it can go with the current Minimum Wage. The question of whether we should favour start-up companies over incumbents is a complicated one, but if you believe we should (to encourage an entrepreneurial economy) then the "have you paid a dividend yet" mechanism has merit. But is it appropriate that all companies that haven't paid dividends should avoid this higher minimum wage requirement? A company that is fully owner managed (where all the shareholders can receive salaries and bonuses) may have no pressing need to pay a dividend. Eventually founders retire and/or family members who don't work in the business inherit shares, at which point there becomes pressure to pay dividends - but if it's been able to self-finance growth the company could be very large before this happens. Mutual structures (like partnerships or co-operatives) are employee-owned models that (broadly speaking) don't pay dividends. Take the John Lewis Partnership as an example: the ordinary shares yield no dividend as they are owned by the JLP Trust which pays eligible employees a partnership bonus. [I know there are JLP preference shares which do yield a dividend but let's not get bogged down in that]. Even putting aside the employee owned models, some companies may wait a very long time before paying their first dividend. If a successful company can reinvest their profits for a greater return than their investor's cost of capital then they maximise shareholder value creation by reinvesting rather than returning money to shareholders (who also incur tax charges in the process). Of course - per the logic above - this can't go on for ever; but companies that to date have never paid dividends include Amazon, Ebay and Google. Apple Inc didn't pay its first dividend until 2012. I think by now you'll have got the point: there are many large successful companies that would avoid the requirement to pay the Living Wage if it was based purely on whether or not they have paid (or yet want to pay) a dividend. Highest paid executive's salary greater than £250k? Retained profit on balance sheet of over £1m? It's a model worth considering if you accept the principle that those who could pay the Living Wage should. If a company is making profits that get taxed and some of those taxes are going to provide state support to their employees ... why not cut out the middle man and simply tax the company less on the basis that they pay their employees more? Theoretically a "zero sum game" might be possible here where shareholders earn exactly the same dividends and employees receive the same net income, but all that income comes directly from the employer as wages rather than partially via state benefits. Unfortunately finding a mechanism to achieve this in practice is probably impossible. Personally I think the principle of rewarding companies for paying all their staff the Living Wage or more is a non-starter. Some companies will be in sectors where they have few or no staff below the Living Wage simply by the nature of their industry (professional services firms for example) - they would be rewarded for carrying on business as usual. If instead (as Labour proposed at the last election) you reward companies who move from having some employees below the Living Wage to being a Living Wage employer, you are effectively penalising their competitors who may have already voluntarily put in place a Living Wage policy before the incentive was offered. The alternative might be to raise the NMW for all employees and for the state to create a mechanism for redirecting the money saved (in lower benefit payments) to those companies that need support as a result of the higher NMW. By definition these companies are unlikely to be paying much (if any) corporation tax, so some other mechanism other than corporation tax relief would need to be found. This is a fascinating and important topic that deserves considered debate, so it's unfortunate that Corbyn has chosen to wade in using poorly chosen language and ideas that - at least at first glance - appear not to have been properly thought through.